Sister M. Lorraine Gondkofski, I.H.M. 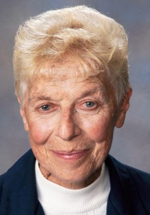 Sister M. Lorraine Gondkofski, I.H.M., formerly Sister Maria Francinus, died March 16 in Camilla Hall, Immaculata, in the 60th year of her religious life. She was 78 years old. Born in Philadelphia, Sister Lorraine entered the Congregation of the Sisters Servants of the Immaculate Heart of Mary in 1956 from St. Mary of the Assumption Parish in Manayunk, Philadelphia, and professed her vows in 1958. She taught in elementary schools in the Archdiocese of Philadelphia and the Dioceses of Richmond, Arlington and San Jose, and the Archdiocese of Miami. She also ministered at Lazarus House in Lawrence, Mass., before becoming director of religious education in the Richmond and Hartford Dioceses, and the Miami Archdiocese, where she was at the time of her death. The funeral Mass was celebrated March 21 at Camilla Hall. Msgr. Chanel Jeanty was the celebrant and Sulpician Father Gerald L. Brown was a concelebrant and the homilist. Father William Dean and Msgr. Joseph Logrip were also concelebrants. Sister Lorraine is survived by her local community from St. Rose of Lima Convent, Miami Shores, Fla., her congregation of I.H.M. sisters and many loving nieces, nephews, grandnieces and grandnephews. She was predeceased by her parents Frank and Marie Swider Gondkofski and her sister, Marie (Carl) Maslowski.